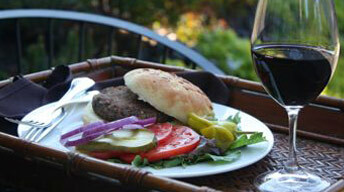 Buns and favorite hamburger fixings, great with blue cheese on this burger. Before you start, bring a pot of water to a boil. After it boils turn it down to a simmer. Heat a medium sized pot over medium-high heat. Add the olive oil, sweat the onions and garlic for about 1 minute. Add the chili flakes, stir for about 15 seconds. Add the rice, stir for another 15 seconds. Add the sherry, red wine and a pinch of salt, stir until the liquid is gone. Add the first addition of hot water, adjust the heat so it is just a simmer…then add the tahini, soy sauce and hoisin. Stir until the liquid is absorbed…repeat this process with the remaining water, until the rice is cooked. When the rice is done remove from the heat and transfer to a mixing bowl. Add the thyme, parsley, bread crumbs and pecans…mix together and let cool slightly. Add the egg and parmesan cheese, season to taste with salt and pepper. Divide the mixture into 6-8 even balls, form patties. Refrigerate at least 4 hours or overnight. Preheat grill to medium high. Lightly spray each burger with non-stick spray or lightly olive oil. Grill 3-4 minutes per side, being careful not to burn the burger. Remove and set up with your favorite fixing.